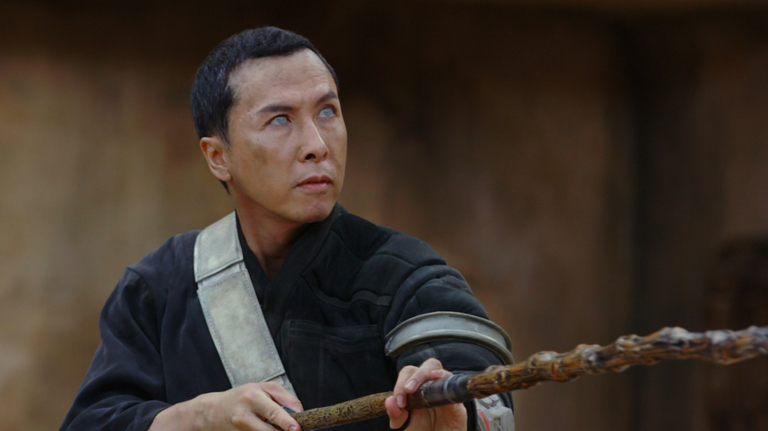 Donnie Yen plays the badass, blind, warrior monk Chirrut Imwe in Rogue One: A Star Wars Story and I cosplayed as him at Emerald City Comicon. 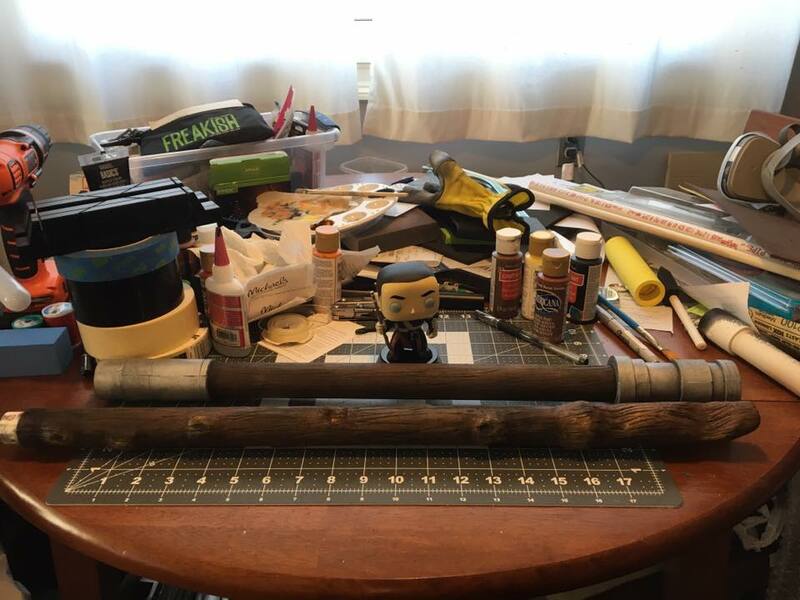 I started this cosplay by making his staff so here's how I did it. The actual length of his staff varies throughout the movie so I decided to use this image as my reference. The overall length would be from the ground to my armpit, and the midpoint would be around where my hand is. So I used two lengths of 3/4" pvc pipe and a coupler to match the length I wanted the staff to be. The coupler helps to disassemble the staff for travel purposes, a technique learned from Bill Doran's Foamsmith Vol 2 book and his Skyrim axe video. I cut a piece of 3mm foam to wrap around the pvc pipe. And it's glued on with Barge contact cement. This is the top half of the staff. For the bottom half, the tip looks like a twisty piece of wood and the only way I could achieve that effect was to carve it out of foam. So I cut off a few inches of the end with a hacksaw and glued on this foam cylinder I got from a building block set which has proven very handy for other projects. Here's how the cylinder looks glued to the bottom half pvc pipe which is now also covered in 3mm foam. The bottom half of the staff has knots in it, so I "randomly" marked out where they would go and cut out squares of 3mm foam. These were then glued on with Barge. I then used a Dremel to blend the edges in, make a little hole in the middle, and to carve the wood grain. For the tip, I hacked out the basic shape with a utility knife, and then I smoothed everything out with a Dremel. And I finished carving in the wood grain. This effect was achieved using a sanding drum on my Dremel and just randomly "going to town" on the staff. I then wrapped additional layers of 6mm foam to create the top and middle cylinders. I ended up with some gaps so those were filled in with DAP Kwik Seal, a technique learned from Evil Ted Smith. The center cylinder which hides the pvc coupler. The two halves were sealed with several coats of Plastidip. After that, I masked off the "wood" parts to paint the cylinder parts silver. For the wood, I started with a basic brown acrylic color. Then I progressively added more layers of browns like burnt sienna, burnt umber, and I even added some highlights of reds, yellows, and oranges. After a little bit of weathering to highlight the dark lowpoints and a matte clear coat, here's the finished staff. A closeup of the top portion. Top cylinder, which is supposed to contain a kyber crystal. End of the staff. Another benefit of the tip being made of foam is that I can boop people with it and it won't hurt like pvc or wood would. Some closeups of the knotting. It's really key to get different layers of colors in there. "All is as the Force wills it." Thanks to Funko Chirrut for overseeing this project! I'll be talking about how I made the armor pieces, the bandolier, and the outfit later on. 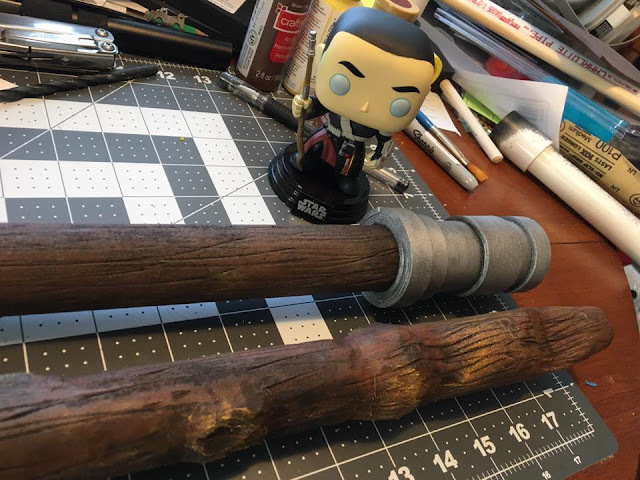 So for now, if you're making your own wooden staff, happy crafting!